Description : This is one of my most favorite HP drawings ever! I just love the difference of everyone's expressions and Luna is so unabashed and bold about what she wears! THIS has to be one of your best works YET ag! Every expression on EVERYONE's faces are PRICELESS! Honestly, I would pay big money to have that framed in my living room! You have some truely amazing work! It's amazing how you capture the expressions on everyone's faces! Truely remarkable. Gosh! I LOVE all your drawings! This is definetly one of my favs.!!! You can practically hear everyones thoughts! Very good! Except Ginny looks rather young, like 11 in this picture. She's supposed to be 14, right? Lol! This explains itself entirely! 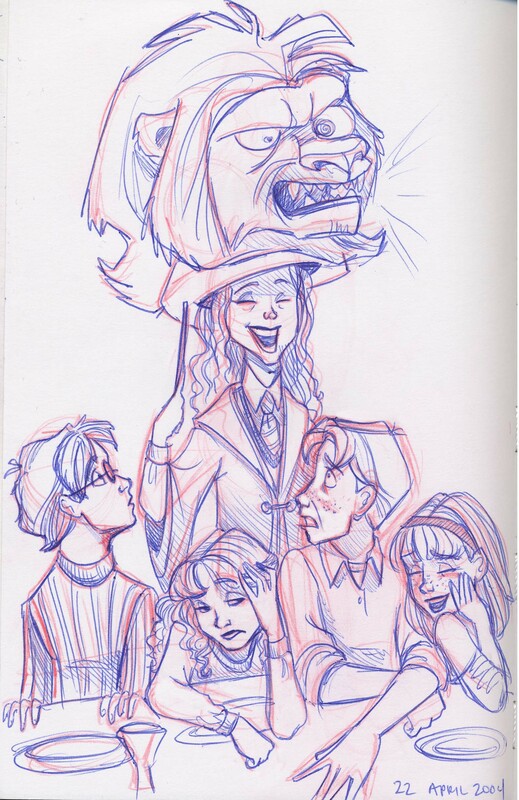 I love all their expressions, though I feel bad that Hermione can't laugh about this. I want to go back to HS as Luna. I can't really express how much I love this drawing, but make no mistake- I do love it immensely! I want to be there so I can piss myself laughing at Luna (or rather, with Ginny). The hat... Merlin, it looks like a sort of anthro-Moody! I love this one, they're expessions a fantastic! OH, dang, you forgot the snake. But it's still amazing. oh wait, she couldn't put in the snake. isn't the lions' mouth OPEN not closed and growling? Picky, picky, picky... Besides, he mouth IS open, just maybe not as wide as you would prefer. And it is growling. See the noise marks coming from its mouth? That indicates growling. wonderful, I luv Ron's shocked expression and Hermionies "oh great..." expression. AbSoLuTeLy LoVeE It!!!!!!!!!! excellent.... fantabulous...... wonderful..... magnifique.... gorgeous..... 1 of Ur best!!!!!!! I love this picture! Very nice composition.